I made this comic for Storylines because I wanted to show the children how you could make a mini-comic on one A4 sheet of paper that can fold up to be a book. I used our bunnies as inspiration because I also wanted to explain how you can use real life detail and morph it into a fantasy story. It was fun and exhausting running the zines and comics stand at Storylines – so many kids came and drew/wrote/collaged wonderful stories. I folded and cut and chatted for 5 hours straight. And that was straight after coming home from the wonderful Christchurch writers’ festival. I’ve got a comic I want to do about that one… see you soon! I adore this. It’s sweet and magical and I love how big the bunnies get. I look forward to your comic about the writers’ festival. Love it! I might be more than a little bias. p.s. I bought the latest Metro and saw your transport piece “in the flesh”. Very nice. Great job Sarah, Storylines sure is a blast of a day. I saw you all hard at work there. Glad to see zines being a part of it. 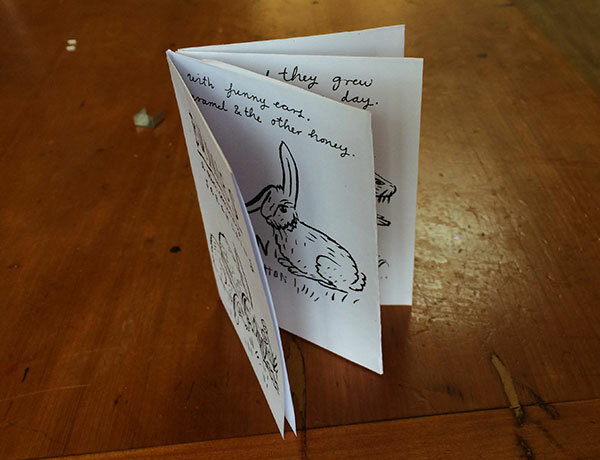 Is the bunnies book made with what I know as a Dutch-cut technique? I’ve got templates I print out for that at my school library. I have 3 alternatives – blank, lines and alternating blank and lined pages. The girls really love making them and put all sorts of content in them.